Patrick began his exploration of Tai Chi in the late 1980’s, after 5 years of judo, jujitsu and karate training with 8th Dan judo sensei Joe Robinson. 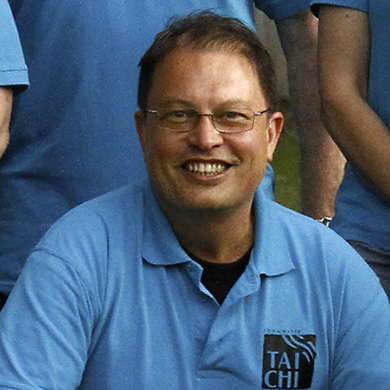 In 1991 Patrick joined Tai Chi teacher Brian Cooper’s Brighton class and has been practising under his guidance ever since.Originally learning Rose Lee’s version of the Yang long form with Brian, Patrick was then introduced to lineage-holder Bruce Frantzis, on whose methods Brian had decided to focus his teachings. From 1993 to the present, Patrick has based his practice on Bruce’s very undiluted teachings.Patrick began teaching in 2004 and is a registered instructor of the Tai Chi Union for Great Britain, and certified Energy Arts instructor of Dragon and Tiger Chi Gung, and Wu Style Long Form. He has also begun study with Sam Masich, learning the traditional Yang style Tai Chi curriculum.